This is the first set of papers and matching corner photo holders for THE WAY WE WERE. If you came directly to this page click HERE and HERE to see more of what is included in this kit. I've packaged these papers and photo holders in 3 separate zip files to make quicker downloads especially for those who are on dial-up. I may have the second set of papers available today but certainly tomorrow so check back later. Thank you, these are lovely. The overlays are great usage of the papers. TY so very much for thiese MAGNIFICENT BG's!!!!!!!!!! WOW! I always see wonderful and beautiful things from your creations! I am so grateful that you are so generous! Thanks! Thank you so very much for sharing your awesome and wonderfully creative and beautiful hard work with me!! 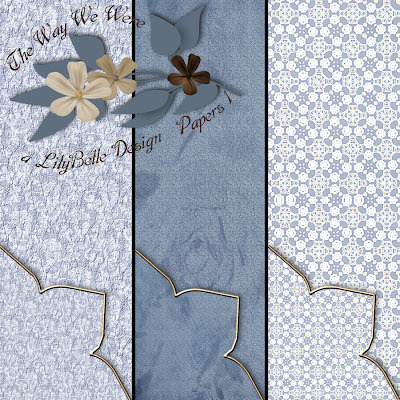 So beautiful with the first paper pack and its lovely shades and hues of blue-grays. Your creativeness is known and so appreciated. Thanks for leaving the links available for us late comers, meaning me and for all the wonderful papers and gorgeous elements. A prize for sure to lift up my family photos. (LOL.) Our Celestrial Guardian continues to shine upon you and yours. Wow. I was leaving comments on the shared4 until I realized how many where in this set. Please take this as my Thank you for all of them! They are beautiful and I plan on using them for my February calendar of 2009 for my hubby... Thank you again!